Olomouc  (Olomóc or Holomóc in the local dialect, Olmütz in German) has the second largest and second oldest historic preservation zone in the Czech Republic (after Prague). Olomouc lies astride the Morava River and is surrounded by the fertile Haná plain. It was the capital of Moravia until 1641 and is the six-largest city in the country, with approximately 99,500 inhabitants. The first written mention of a settlement at Olomouc is almost 1000 years ago when the Kosmas Chronicle described a fortified castle watching over the important Morava river ford on the road between Krakow and Prague. Between 16th and 19th centuries, Olomouc served as a strategically important fortress. The city today is the seat of the regional government, the Moravian archbishopric and the oldest university in Moravia, Palacky University (Universita Palackého). Legend claims that the city was founded by Julius Caesar. It's unlikely that Caesar actually visited in person, but it is known that the city was originally a Roman military camp with the name Julii Mons (Julius' Hill). This name was gradually corrupted to its present form, Olomouc - which is pronounced 'Olo-mowts'. The Roman influence is a proud heritage of the city, and manifests itself in numerous areas. As the home to Palacky University, Olomouc is the country’s largest student city by percentage of population. Palacky University is one of the largest and most prestigious universities in the country and only Charles’ University in Prague has a longer history. During the academic year, the population of the city is increased by roughly 20,000 students, giving the city a vibrant feeling of life and energy. This is important to remember if you want to enjoy the thriving nightlife of the city - many bars and clubs depend on the student population and close for the summer vacations. Olomouc has been the seat of the Catholic Archbishop for almost 1,000 years, and thus has some of the most beautifully decorated churches in Central Europe - though they will not appear in many travel guides. Fast trains (category R) are useless at this route, they're slower and cost the same as IC/EC. Regular fare is CZK 324, second person in a group (of 2 or more) pays 195, extra people pay CZK 162, SporoTiket is CZK 190. Beware that apart from these, there are trains Brno–Olomouc via Břeclav and the journey would be 2 hours longer. Beware of some fast trains (category R) from Ostrava to Olomouc, they go longer way through Jeseníky mountains for more than 3 hours. Kraków: The only direct train is a night train Silesia arriving in Olomouc at 4:45AM. Other connections require at least one change. Long distance trains stop at Olomouc hlavní nádraží (Olomouc Main station). Student Agency  operate buses between Prague and Olomouc, but they are much slower than trains, because their route leads all the way down to Brno, before turning up towards Prague. The Olomouc city centre is best explored on foot. Its historic center is charming and it offers many opportunities for pleasant walks. Integrated Transport System of Olomouc Region (IDSOK) provides an extensive network of local trains (category Os and Sp) and buses in the whole region. Olomouc region is divided into zones , the ticket price depends on number of passed zones. Zone 71 (Olomouc city) has a special tariff, described above. Taxis gather in the carpark at the front of the train station, and the ride from there to the centre should be between 100-150 Kč. The free-call number is (+420) 800 223 030. Olomouc is an exploring sightseer's paradise. A good place to begin is the main square (Horní náměstí or 'Upper Square'), with its huge Town Hall and the Holy Trinity Column (the largest column in Europe), which was enscribed on the UNESCO World Heritage List in 2000. It is the second largest historical square in the Czech Republic. Don't miss the astronomical clock on the Town Hall. It is said to once have rivalled the beauty of Prague's, but was seriously damaged in the WWII and then rebuilt and repainted at the beginning of the Communist regime to reflect worker's values. The baroque Holy Trinity Column was built in the early 1700's and consecrated by the Empress Marie Theresa in 1754. With a height of 35 metres, it has dominated the Upper Square (Horní náměstí) ever since and was added to the UNESCO list of World Cultural Heritage in the year 2000. The column features sculptures of the Holy Trinity (predictably), the assumption of the Virgin Mary, all twelve apostles, three virtues and the most important saints of the Baroque period. The base of the column contains a small chapel with amazing acoustics and the raised pedestal is a very nice place to sit and eat lunch. It is one of the traditional rendezvous points in the city. The renaissance Olomouc Town Hall occupies the centre of the main square (Horní náměstí). Its halls and chapel are accessible on guided tours and it's possible to climb the tower each day at 11AM and 3PM. The ground floor of the town hall houses a gallery, restaurant and the tourist information office. Ask in the office if you are interested in the guided tour and climbing the tower. On the north face is one of only two astronomical clocks in the country. On the west side, there is the Hygieia fountain from 1945, one of the many fountains in the city. The Astronomical clock was constructed in the 15th Century, but takes its present appearance from the 1950's, during a refurbishment to repair damage inflicted in WWII. Czechoslovakia was under Communist rule by then and the clock reflects the values of the day, the saints and angels being replaced by scientists, sportspeople and labourers. At 12 noon the clock has a presentation that is unique to its structure and construction. There is one other astronomical clock in the Czech lands (in the other ancient capital, Prague), but as a surviving example of Socialist-Realism, the Olomouc Astronomical clock is unique world-wide. It is another popular rendezvous point in the city. The baroque Caesar's Fountain is the largest fountain in Olomouc. It depicts the legendary founder of the city, Gaius Julius Caesar, riding a horse. It is one of the six great baroque Roman-themed fountains you can find in the city. The baroque Hercules' Fountain depicts Hercules fighting Hydra. Another from the series of the six great baroque Roman-themed fountains you can find in the city. The modern Arion's Fountaindepicts the legend of a poet thrown overboard and saved by a dolphin. It was specially designed to allow easy access to the water and is a favourite among children. The bronze model of the city. St. Wenceslas Cathedral, a thousand-year-old cathedral, dominates the city’s skyline with the tallest spire in Moravia, (second tallest in the Czech Republic) Pope John Paul II and Mother Tereza have both visited the cathedral and the holy relics of Saint Jan Sarkander are interred within. St. Moritz church is a beautifully preserved gothic church dating from 1398. One of its highlights is the massive Engler organ, one of the largest in Europe. The organ is the focus of the international music festival in September/October and the Christmas Music festival every year. The tower of the church offers a magnificent 360 degree view over the city and countryside and is accessed via a graceful double-spiral staircase. St. Michael's church appears quite plain from the outside. Upon entering, however, most first time visitors find their breath stolen away. Inside is one of the most beautiful baroque churches in Central Europe. One notable feature is a painting of an apparently pregnant Virgin Mary, quite rare in a catholic church. It’s also possible to enter the old monastery attached to the side of the church and climb its bell tower. Basilica Minor on the Holy Hill (Svatý Kopeček). This is one of the most popular pilgrimage churches in Central Europe, and was honoured by Pope John Paul II. The best way to reach it is to take the bus 11 to Svatý Kopeček from stand 'E' in front of the railway station. The University is spread throughout the city, but the most interesting parts to visitors are between the main square and St. Wenceslas’ Cathedral. The fine arts faculty has a sunny terrace courtyard with a café and views over the city walls from above. Also notable is the law campus on 17th. November Ave. which was formerly the headquarters of the Communist party. Baroque Fountains. The city’s impeccable series of six stone baroque fountains are all within easy walking distance of the Main Square. They are based on Roman themes, and depict Neptune, Jupiter (both on Dolní náměstí), Mercury (near the Prior store), Triton (on Náměstí republiky), Hercules, and the legendary founder of Olomouc, Julius Caesar (both on Horní náměstí, the main square). There are also two more baroque fountains that were damaged and lost their central statues, Saturn fountain in the Hradisko monastery and Dolphin fountain near the Virgin Mary church. The missing statue of a child with a dolphin on the latter fountain was replaced a with lion head. Modern fountains. There are also several remarkable modern fountains in Olomouc. The Arion fountain in the main square (Horní náměstí) depicts the legend of a poet thrown overboard and saved by a dolphin. It was specially designed to allow easy access to the water and is a favourite among children. Hygieia fountain can be found nearby in the west wall of the Town Hall. Bronze Living Water fountaincan be found next to the Chapel of St. Sarkander. There are also two fountains located near the Main Railway Station, one of which ‘dances’ along to recorded classical music. The Archbishops’ palace on Wurmova Ulice is open to the public just one day per week. It was in this building on 2 December 1848, that [Franz Joseph] acceded to the throne of the [Austro-Hungarian Hapsburg Empire]. The Premyslid palace has recently undergone a thorough restoration and now houses the extensive Archdiocese museum. The building is the oldest in Olomouc and much of the original stonework has been exposed. On the upper floors, the circular chapel of St Barbara is a highlight. Entry is 50Kč for adults, but free of charge every Wednesday and Sunday. The museum is closed every Monday. Hradisko Monastery is the oldest in Moravia and its location on the banks of the Morava river, just upstream from the orthodox church, make it a pleasant 20-minute walk from the cathedral end of town. The monastery building has belonged to the military since the monastic order was banned by [Emperor Joseph II] in . It is now used as a hospital and is open to the public for sightseeing only on Thursdays. Walking tours Perhaps the best thing you can do while in Olomouc is to join up with a walking tour. The theatre in the square is home to the Moravian Philharmonic Orchestra, as well as numerous musicals, operas, and plays. The price for tickets is difficult to beat. Be warned that the dialogue will usually be either in Czech or the original language. The Zoo on the Holy Hill is also worth a visit. It is located near the basilica. There are pointers from the basilica to the ZOO or ask the locals for directions. You can also take the bus line 11 to the terminal station. The ZOO is in woods abundant in edible mushrooms suitable for pleasant walks. The Museum of Modern Art (Muzeum moderního uměni) is the pale grey building across from the baroque Lady Mary of the Snows church. The permanent collection is OK, but the temporary exhibitions are often very interesting and well worth the 50Kc entrance fee (free on Wednesdays and Sundays) There’s a small lookout tower at the top which is included in the entry price of the museum. The History and Nature museum (Vlastivědné Muzeum) is housed in the former Clarisian convent on Náměstí Republiky (Republic Square). There are the usual collection of rocks and artifacts, and an interesting exhibit of the flora and fauna of the region, but probably the best things to see are in the old Olomouc section; woodcuts and prints from previous centuries, weapons, armour, traditional dress and many of the original religious figures from older versions of the astronomical clock. The museum is closed every Monday. The Botanic Gardens are in two parts; the outdoor exhibits and rose gardens are across the stream from Bezruč gardens, which is the park below the tall city walls (behind St Michael’s church). The greenhouses are behind the Flora exhibition complex; near where the footbridge goes over the main road to connect the two parks together. The main tropical greenhouse also holds large aquariums and terrariums with a range of alligators, snakes, piranhas, and large furry spiders. City Walls A series of defensive fortifications and moats once completely enclosed Olomouc. 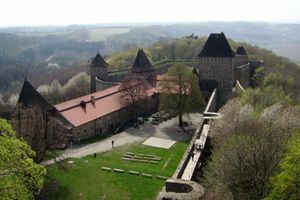 The best preserved parts are visible from the Bezruč gardens, below St. Michaels church. The water barracks that today house the Russian and Irish pubs and the 24hr espresso bar were also part of the system. There were also sixteen outlying forts, some of which still exist. Most still belong to the military and are off limits to the public, but one is home to ‘Exit discotheque’, and another is within the grounds of the botanic gardens. Enter just across the mill channel from Bezruč gardens, via the footbridge guarded by the four statues of Hercules. Commercial Art Galleries Czech and Moravian artists produce a lot of very unusual ceramic/pottery pieces and small works of art, which make great original souvenirs or gifts, and there are several shops/galleries in Olomouc filled with them. Some of the best are situated on Ztracena Ulice which heads off the square from the Caesar fountain. Next to Cafe Caesar in the town hall building is Gallery Caesar. It almost always exhibits contemporary art from local Olomouc or Czech artists. Gallery Mona Lisa (also a café), on the corner of the square near the Arion fountain (turtle fountain) is a similar exhibition space focused on contemporary art. In the beautiful Villa Primavesi right next to St Michael’s Church there is another small gallery worth visiting if only for the chance to wander through the entrance hall of this historic house. On the top floor of the local art museum there is a small exhibit about Villa Primavesi, its history and role in the Art Nouveau movement. Go Karting at Motokary Olomouc . This is located at the top of a parking building on the corner of Hanáckého pluku and Koželužská. The cars are fast enough and it is fun, although the track is quite tight with only one place to overtake someone of similar speed. 190 CZK for ten minutes, with discounts for groups or on Monday through Thursday. The Ice Hockey stadium is on Hynaisova, behind the supermarket. Hockey Club Olomouc competes in the country;s top hockey league, the Extraliga. Despite the ageing stadium Ice Hockey is a fantastic spectator sport, a real piece of local life and probably the best two hours’ entertainment you will find for the cost of admission (100-160Kc depending on which seats you choose, 2014/15 season price). The Letní Kino (summer cinema) is only open in the warmer months and shows films four nights a week, beginning as soon as it gets dark enough. The entrance is from Pekarska Ul. You can’t see the cinema from the street but it’s the same entrance as the mini-golf and you will walk past a large outdoor beer garden before finding the entrance to the cinema. The cinema is an amphitheatre that can hold 3000 people. You can see it quite well on the town model in the main square. Flora OlomoucIn Spring, you should not miss the Flora Fairgrounds and nearby parks full of flowers. Check the Flora Fairgrounds website  for information about exhibitions. The Easter Music Festival involves performances of international musicians in the cathedral and largest churches of Olomouc. Academia Film is an international festival of documentary films. Most venues are close to the fine arts faculty of the university, with some being shown outdoors on a screen in the main square. Dvořak's Olomouc is a series of concerts of classical music taking place during May and June. The Moravian Philharmonic and visiting orchestras perform on the square and in the churches. The Song Festival in early May gathers choirs from as far as Singapore and the United States to perform and compete. The choirs often burst spontaneously into song as they walk together around the streets and squares and it's a delighful time to be in Olomouc. Olomouc City Festival in June is ten days of concerts, theatre, sculpture and ceramics demonstrations, a whipped cream battle, and at least two lamplight processions. The Marshall Radetzky Celebrations on the first weekend of September draw military bands from across Europe to honour the legendary Austrian general, onetime commander of the Olomouc Fortress and subject of Johann Strauss' immortal 'Radetzky March'. International Organ Music Festival is organised by the Moravian Philhamonic Orchestra and takes place in various venues around the city, including on the largest pipe-organ in central Europe-in St Moritz church. Crossroads is a festival of Central European cultural exchange betweens artists, writers, musicians and translators from neighbouring countries. For the public there are readings, films and concerts. Traditional Christmas Markets take over the main square from the beginning of December. There are free concerts every day, roasted chestnuts, mulled wine and and other warming foods and traditional crafts ranging from blacksmith-work to the finest beeswax and honey products. The traditional cuisine of Olomouc and the surrounding Haná region is an excellent example of Czech cuisine. In addition to more common Czech dishes, it includes some unique local specialties. One of the best known culinary products of the area is the Olomoucké tvarůžky cheese (also called Olomoucké syrečky). This is a traditional (since 15th century) Czech ripened soft cheese with very low fat content, pungent taste and strong odor. The cheese is named after the city of Olomouc, but is produced in Loštice, a small city about 30 km away. Although the cheese is commonly available in stores around the country (and often consumed raw, usually with some beer), you have to visit Haná region to find dishes based on this cheese on restaurant menus. For example, the cheese can be used as a filling in a local variety of Cordon Bleu, or it can be served fried. The dishes containing this cheese can usually be recognized by the word Loštické in their names. Because of the strong odor, do not be surprised when you find some mint sweets (Hašlerka) on your plate. Garlic soup (česnečka) is available all around the country. The garlic soup of the Haná region (Hanácká česnečka) is one of the best varieties and is usually very strong. If olomoucké tvarůžky are added, the soup is called Loštická česnečka. Because of the combined might of garlic and the strong ripened cheese, it is not recommended if you plan to kiss someone that evening :) On the other hand, garlic is very healthy and you should get some česnečka if you have cold or sore-throat. Hanácký koláč is the typical sweet cake of the region. There are dozens of excellent restaurants in the city, and most have English menus. Local favorites include Cafe Caesar, which is in the renaissance Town Hall Building on the main square. Hanacka Hospoda and U Kasny are more traditional Moravian Restaurants, and are located in the nearby lower square. On Marianska Ul. is the Svatovaclavsky Pivovar which is a non-smoking microbrewery with indoor and outdoor seating and a comprehensive menu of local specialities. Cafe Caesar, named after the legendary founder of the city, serves pizzas and pastas and is on the ground floor of the Town Hall. In summer they have a large outdoor area right on the main square, which is the perfect place to pass a gentle summer's evening. Opera, is another good restaurant serving Italian food. It is also located on the main square (Horní náměstí). Cafe 87 is a café famous for its excellent chocolate cakes. In the morning, they also serve excellent breakfasts in English style. It is in the same building as the museum of modern art. U Andela is one of the best restaurants in Olomouc. The menu and wine list are extensive, and the rear rooms of the restaurant look out from the top of the city walls across the park. The interior is decorated with lots of interesting antiques and hundreds of potted plants. An example from the menu is the "Dinosaur Steak", which is a chicken fillet on top of a pork cutlet on top of a beef steak for 139Kc(about €6). Hlava 21 is a newish restaurant on Uhelna Ulice. The space is clean and modern and the well-priced and delicious meals keep the place busy. They also have an extensive selection of cocktails. Chicken with broccoli and steamed vegetables 129Kc. Restaurant Pizza U Jana This is a little way out of the centre, past the Bus Station, but it serves some of the best food in the city, especially the steaks. Wine is the lifeblood of Moravia. Look into any ‘vinarna’ (wine bar) or ‘Vinný sklep’ (wine cellar) and you’ll see an array of characters partaking of the nectar of the vines. Most vineyards are in South Moravia but that has no affect on the drinking abilities of northern Moravians. You can buy good Moravian wine for a picnic from a vinny sklep in plastic bottles that you either bring yourself or you can find there. If anyone has told you that Moravian wine is inferior to French or German wine, don’t believe them. The taste and aroma of Moravian wines vary from their Western European cousins because they are made from totally different varieties of grapes. Svatovavrinecké is a strong, drier red wine, Modrý Portugal is a medium dry and Frankovka is a sweeter red wine. Good white wines are Muller Thurgau and Veletinské. Beer The best beer in Olomouc is available from one of the Microbreweries making their own beer on the premises. St Wenceslas Brewery (Svatovaclavsky pivovar) on Marianska Ul. is a large microbrewery serving five brews including wheat and fruit flavoured beers. The new location is completely non-smoking and has an outdoor area. In the cellar is an old nuclear fallout shelter that the proprietors plan to renovate to offer spas in oak vats of dark beer scented with a special mix of herbs. The food is very good and lunch specials start from 70Kc. Moritz is a completely non-smoking microbrewery, which is impeccably furnished in an early 20th century style. Large internal windows allow patrons a view of the brewing room. Vertigo is a great subterranean bar, packed with local and international students, and mock cave paintings on the wall. It’s a good place to meet people because you almost always have to share a table. Jazz Club Tibet has a regular program of concerts. Everything from Jazz to Blues to funk to reggae. 9a is a spotless bar that is popular with university students. And rockclimbers. There's a climbing wall in one of the back rooms. Rasputin is a Russian themed bar in the water barracks, the long low brick building beside Freedom avenue (Tr.Svobody) which was once part of the city walls. Belmondo is one of the better places in the centre for dancing. Also in the water barracks, there's a cover charge only on Friday and Saturday nights. Regular and visiting DJ's. Captain Morgans  is a large bar, club and restaurant in the water barracks. There is normally a relaxed atmosphere during the week, and a DJ on the weekends. The Crack is a small Irish pub in the water barracks. Klub 15 Minut  has moved from its original location in the university library to Komenskeho ul. 31, a riverside location across from the the orthodox church. It remains one of the best live music venues in the city. Koktejly & Sny  (meaning Cocktails & Dreams) is, as its name suggests, an 50's America themed Cocktail bar. Its location close to the city center is perfect, if you want to drink a few cocktails before going to a club. Adress: Uhelna 1168/8. Hanácká kyselka is a well known natural mineral water of the region. It is healthy and has a refreshing taste. It is a good choice if you do not want to drink alcohol. You can find really cheap accommodation in the student dorms in the outer suburb of Neredin, between the airport and the cemetery. There are always a few vacant rooms. Unfortunately there is not much information in English about the dorms, but the tourist information office should be able to help. There are several hotels in the city; Hotel Flora, Hotel Lafayette, Hotel Sigma and Hotel Gemo have been around for years, and the Alley Business Hotel is the new kid on the block. Opera café on the main square (Horní náměstí) and probably other restaurants offer wifi access. Ask the waiter for the passphrase. Slam is an internet café in the northern part of the city center, at Sokolská 12. Printing (both black and white and photos) and card readers are available. The mobile network (GSM/GPRS) covers the whole city. If you are coming from a non-GSM standard country (eg. North America) check your mobile phone for GSM compatibility. Olomouc is an ideal base for daytrips into the Moravian countryside. Within an hour’s travel by car, bus, train or bicycle there are castles, cave complexes, natural reserves and well-preserved historic towns, including some on the UNESCO world–heritage list. An enjoyable way of exploring the Olomouc region is by bike. You can rent a bike at the Main Railway station for 150 Kč/day and follow one of many well marked bicycle tracks. Especially good times to visit are Spring, when there are carpets of white flowers everywhere; and Autumn when the birch, linden, ash, oak and maple trees begin to change. Maps of cycling trails are available from tourist information, news stands and bookstores. Closest to Olomouc and suitable even as half-day trips are Svatý Kopeček (Holy Hill), the Litovelské Pomoraví [cs.wikipedia.org/wiki/Litovelské_Pomoraví] protected natural reserve and the swimming holes at Poděbrady and Výkleky. Svatý Kopeček is the hill that rises up to the east of Olomouc. If you arrive by train from Prague, you’ll have a good view of the building near its peak, which is the Basilica of the Visitation of the Virgin Mary. Surrounded by forest behind the basilica is the Olomouc Zoo , which is well respected for its work with more than 50 endangered species, included Rothschild’s Giraffes. The Litovelské Pomoraví nature park stretches from Olomouc to the town of Litovel, 18km away along the Morava River. The walking and cycling trails across the flat flood plains and through the forests are popular with locals and suitable for outings with young children. Near U Tri Mostu (8km from Olomouc) is a clearing with the horseriding ranch and outdoor restaurant Lovecká Chata. Poděbrady is a former gravel quarry that has been flooded with fresh water to form Olomouc’s most convenient natural swimming area. Just on the edge of the Litovelské Pomoraví, it’s connected to the city by walking and cycle trails or town bus #18 which stops on the nearby roadside. Swimming at Výkleky A prettier place to go swimming though is the old rock quarry at Výkleky, 18km east of Olomouc. The cycling route is a little complicated, but buses to Lipník stop at Velký Ujezd, a 20-minute walk from Výkleky. The castles, caves and historic towns are further afield and will require a vehicle or the use of public transport. Litomyšl (80km from Olomouc) is one of the Czech Republic’s prettiest small towns and is UNESCO-listed for its renaissance chateau. The chateau is covered with amazingly intricate sgraffito plaster decorations and has one of only five baroque theatres left in the world. Buses from Olomouc to Hradec Králové stop at Litomyšl or you can take the train to Česká Třebova and switch to a local bus from there. This page was last edited on 26 September 2018, at 07:35.